I picked up mom early for her doctor appointment so we could enjoy lunch together. We had a great time. Mom needed to get out for a little while. Once we arrived at the doctor, we learned the appointment was a big mistake. Mom's primary care doctor's first name is Gilbert, last name Emde (pronounced MD) --Gilbert Emde MD...anyway... another MD is doctor Gilbert, here in Ponca City. We were instructed to set up this appointment with Dr. Gilbert MD--when really, it was supposed to be with Dr. Gilbert Emde, MD. The crazier thing is--these two doctors actually attended and graduated medical school together. They're friends--and I'm sure they'll be discussing and sharing a laugh or two over this mix-up. Oh well-- mom and I had a nice time out and about! I received a call from the nursing center while we were sitting in the waiting room. They were calling to inform me that mom's progress is ahead of schedule and they're releasing her from skilled care on Friday. Now, she'll transition to a different kind of arrangement. It's a very positive thing. It's a big indicator of her exceptional progress in the last 45 days. My plan had to be tight today. I wasn't able to get everything I wanted done, done--and that's okay. I'll have plenty to do/finish tomorrow. I'm dropping in bed within minutes. It's been a long day. Today: I maintained the integrity of my maintenance calorie budget. I remained refined sugar-free. I exceeded my daily water goal. And I stayed well connected with great support contacts. Today was one of those non-stop days, start to finish. Okay, that's not completely true--I did grab an hour nap between 4 and 5pm, otherwise, I was moving and getting things done. I took mom a few things and her laundry tonight. She had the biggest smile on her face. She weighed today and found another loss! She's consistently losing weight in a way that's contrary to her natural perception of "eat less/lose weight." She's eating more, but on a consistent schedule--and this regular nutrition is something her metabolism is loving, obviously. 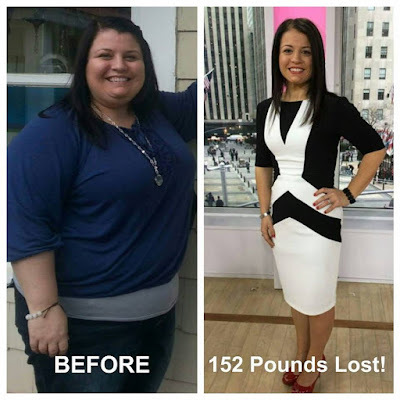 She said, "all those years I tried to lose weight--and now I'm not trying, and I'm losing weight." Part of mom's therapy plan is working toward getting her completely off the added oxygen machine. I was pleasantly surprised to find mom sitting in the common area this evening without her oxygen machine. She has her own oximeter and she's constantly checking her blood oxygen levels. After being off of it nearly all day, she's still averaging low to mid 90%. All of this improvement is very promising. I'll pick her up late morning tomorrow for a doctors appointment with a physician right here in town. My food is on track, but little else qualifies for that honest distinction. I'm making some improvements on some things--but there's plenty of room for positive changes. The most interesting thing to me is how a non-negotiable stance can be applied to certain things, but in areas where it's also desperately needed, it's difficult to elevate to this absolute status. It's almost like I'm holding on to certain things--doing the minimum non-negotiables and taking a pass on the others in the name of, look how well I'm doing in this area!! But here's the deal: These other elements--workout schedule, sleep, time management, and more--these, if not improved, will work their way into infecting the most solid parts of my daily plan. I've acknowledged this a lot recently--and I'm actually starting to work on these things with an outstanding support contact. Today was a good day with Noah. We fed the geese at a pond not too far from here--and then walked around some trails. He's growing quickly and as he does, he's speaking more clearly. We had some wonderful conversations this weekend. Our chat on the basics of hide and seek schooled me. I just love that little guy to pieces!! I slept in really well today. When I start my day late, it always tilts my food/eating schedule. But I managed okay. A late dinner wasn't the best thing, but it was okay, today. In the future, when I sleep in like that, I think I'll simply not worry about coming in way under budget. It's one day. And one day of less isn't going to hurt. It seems like the better choice when circumstances are such. I maintained the integrity of my maintenance calorie budget. I remained refined sugar-free. I exceeded my water goal. And I stayed well connected with great support. I did some shopping for mom tonight, followed by a nice visit with her. She's doing very well. Her spirits are high and she doesn't have the flu, thank goodness! Another good day is in the books. I'll aim to have another one tomorrow! I've spoken with several who have assured me this extended tiredness is part of the flu recovery process. I slept well last night and still, a few hours after waking, couldn't keep from taking another couple hours rest. Other than that, I'm not really showing any other symptoms. I decided to postpone visiting mom until tomorrow. The flu is still running rampant where she lives. Mom seems to be doing fine. I've talked with her several times today. I did some production tonight and was also set to release another episode of Transformation Planet before a technical glitch prevented tonight's release of the Winifred Morris episode. I'm still new at this podcasting thing--and I'm learning as I go. I hope to have the technical difficulty resolved by tomorrow evening. I'm keeping my grandson overnight. I took him to his favorite indoor playground, The PlayPlace at McDonald's, this evening. He wanted a Happy Meal--and really, he just wanted the toy. I ordered him one and the cashier handed me the bag with "I put an extra order of fries in there for you." Oh, well--thank you! Yeah--those got tossed, along with most of the rest of the food Noah didn't touch. He clearly wanted the toy. We stopped at the grocery store, then made it home in time to prepare a good meal before lively rounds of hide and seek around this small apartment. Noah didn't eat much. He's a picky eater. He's also the type of eater who eats when he's hungry and couldn't care less any other time. I hope he keeps that trait forever! Today: I maintained the integrity of my maintenance calorie budget. I remained refined sugar-free. I met my daily water goal and I stayed well connected with good support. It was a fairly solid day. It's bedtime. Noah is fast asleep in his bed. I will be soon! The extended rest period every single afternoon this week, continued today-and although I'm showing zero flu-like symptoms, I'm convinced the exceptional tiredness is part of the recovery process. I have a long list of things I want to do-- and when I started rattling off a few things on the phone with a friend-- they reminded me that I'm still recovering and to seriously, take it easy. Okay--I will, but it isn't easy. It is important--and it is a part of taking care. It was a busy day at work, punctuated by a midday location broadcast from a cable company. I finished the broadcast, enjoyed lunch and headed back to the studio for production work before heading home to rest. My food plan has been on point. The fundamental elements of my maintenance plan feel good. I take care of the plan each day--and it gives me so very much in return. Someone asked me why I wasn't scaling back on some of my commitments, namely the accountability food tweets and the logging everything in MyFitnessPal...and I simply replied: Maintaining the boundaries of my maintenance plan is critically important. I know what happens when I leave everything open. And while maintaining the integrity of this plan, I'm giving myself multiple opportunities to pause--and this pause gives me a better chance at making the next good choice. Repetition of the routine has created a very nice groove that's comfortable. I've experienced massive relapse/regain--and through that experience, I learned some very valuable things about myself. Number one--If I don't have a personal plan in place, I quickly spiral. I must keep asking the question: "Is this sustainable?" That question has helped me design a plan that works very well for me. Can I do what I do each day, long term, without issue? I really believe I can. Today: I maintained the integrity of my maintenance calorie budget. I remained refined sugar-free. I met my daily water goal and I stayed connected with great support. The past two days have been similar in that I've made it home and absolutely collapsed into a solid nap. Not that it's unusual for me to nap--that's been a thing with me, but it's the deep need for this rest that's unusual. Three solid hours yesterday and three today--and last night, it didn't keep me up. I'm not an expert by any stretch of the imagination, but I want to believe it's my body getting what it needs to finish the recovery process of this flu thing. I can say with 100% certainty and conviction, I needed that rest, especially with today's and this evening's schedule. Another episode of Transformation Planet will be released Saturday. This week's episode features Winifred Morris. She's written several cookbooks (many co-authored with Richard Simmons), worked with Richard in the development of Deal-A-Meal, played a significant role with Weight Watchers, hosted her own TV show, and worked alongside Dinah Shore, Suzanne Somers and many others throughout her incredible career. Her experience with food and overall nutritional philosophy is simple and straightforward. Winifred was an exceptionally delightful interviewee. I'm looking forward to sharing our conversation! Plus, you'll meet a friend of mine named Nathaniel, who's just starting his transformation from 671 pounds. I hope you'll subscribe in iTunes, Google Play or wherever you find your favorite podcasts! Today: I maintained the integrity of my maintenance calorie budget. I remained refined sugar-free. I exceeded my daily water goal by 24oz and I stayed well connected with support. I made it back to work today. I got a lot of work complete, then came home not feeling so hot. I had plans for a gym trip tonight and a visit with mom, but I just feel drained. So, I'm taking the cue from my body and resting tonight. I have a busy day planned at work tomorrow, so I need the rest. My plans to visit mom were nixed because the nursing facility is having a flu outbreak. Everyone is pretty much sequestered to their rooms. I did speak with mom and she's feeling fine, in good spirits--and she agreed, it wouldn't be a good idea for me to come that way. I'm headed to bed. Some OTC medicine and more sleep is probably a good idea. Just to give you an idea of the impact flu has had at the studio: We've been fully staffed only two days this month. And apparently, this is common all over the state and beyond. Today: I maintained the integrity of my maintenance calorie budget, I remained refined sugar-free, and I stayed well connected with support. Goodnight! I owe much gratitude to everyone at the studio who have covered for me in my absence. I'll get a chance to thank them tomorrow when I return. Low fever, a sore throat, and sinus headache made up the worst of it today. And that's not bad at all. I chose to take today and make sure I was well enough and rested enough to get back into the swing of things. I slept in very very well today and I woke remarkably better. I'm ready for tomorrow's return. I'll use hand sanitizer and Lysol--just to be certain. And really, that's not a bad practice this time of year. I had a really good day. I enjoyed some good conversations with some great people--a few support contacts, a couple of relatives and of course mom. I'm really looking forward to seeing her tomorrow afternoon. I prepared some great food today--and although my eating schedule was tilted because of the extended sleep time, I'm fine with it--it's one day. I still maintained the boundaries of my maintenance plan. I made refined sugar-free BBQ sauce for my pork tenderloin kabob. It turned out very well. I use regular tomato sauce (checking ingredients first to make sure it's refined sugar-free) and refined sugar-free peach all-fruit and spices--including chili powder, cinnamon, paprika, onion and garlic powder. I'll share the dinner pic as today's featured Tweet. Remember, this meal is calorie adjustable! With 4oz instead of 8oz pork tenderloin and 150g instead of 241g sweet potatoes, it's a calorie adjusted 411. Make it 6oz pork instead of 4oz and it's still a low 471. Today: I maintained the integrity of my maintenance calorie budget, I remained refined sugar-free, I met my daily water goal and I stayed well connected with wonderful support. And I enjoyed a good amount of rest--and I'm feeling worlds better. The doctor's office visit told me exactly the same thing so many other people advised...this flu runs its course. The Tamiflu isn't a cure, at best, it simply helps speed the process. I guess I was looking for another round of the Tamiflu meds. Instead, I was told to continue OTC meds, drink plenty of fluids and as long as my fever stays below 100, I could go to work-- just keep disinfectant spray and hand sanitizer at the ready. I'm currently debating whether or not I should take one more day to get better. I've had a low-grade fever all day long. I didn't have horrible symptoms like Sunday, just a beat down feeling--and my throat is fairly raw. Those close to me are encouraging another day to rest and get well. And I know that's solid advice. I just feel like, if I can--I need to be there. I don't know--I'll figure it out in the morning. I'm proud of staying on-plan and on-point with the fundamental elements of my daily actions. I've maintained some semblance of a #morningdeal even if it's been modified a couple times. I've been weighing and measuring, logging in MyFitnessPal and keeping my accountability Twitter feed precisely accurate. I've stayed in contact with support friends, too. The bottom line is, this too shall pass and I'll feel great again, very soon. I'm looking forward to seeing mom. It's been almost a week. I'm so glad she's enjoyed several visitors in the last few days. It's been really good for her spirits. Mom's progress with physical therapy has been consistent as well--and she is starting to feel much more confident in her step. This gets better and better for her--with the continued, consistent, positive care she's receiving, who knows what could happen? Anyway--that's all from here. I did eat well today and it stayed where it needed to stay, despite my unwillingness to cut back on dairy, so that's good. TMI? Sorry about that. Today, I maintained the integrity of my maintenance calorie budget, I remained refined sugar-free, I exceeded my daily water goal and I stayed well connected with good support. I'm going back to the doctor tomorrow. Yesterday was better. Much better. Today was worse. Much worse. This stuff is kicking me pretty hard today. I've limped along with food. I'll end the day over 600 calories under budget. And that's okay. I remained refined sugar-free, of course--and I had a few good contacts with support. Today was better. Things are improving. This flu thing is in its final stages, I do believe. I'm still not 100%, but better. After the last few days, I'll take better. There's a lot of people in this area with the same thing. In fact, one business downtown had to shut down because of flu. That's exactly what they wrote on a sign affixed to their door. One question--How do medical professionals keep from getting this stuff? Flu shots, sure--but still, different strains can get around the shot, so I hear. I've never had a flu shot. That changes starting now. I don't think I'll miss the opportunity in the future. Today: I maintained the integrity of my maintenance calorie budget. I remained refined sugar-free. I exceeded my daily water goal and I stayed connected with support. I'm doing okay. Had a good conversation with mom tonight. She enjoyed some wonderful company today. Irene, Allen, Noah and Amber, plus our friends Linda and her husband Lindel stopped by for visits. Mom was in good spirits. Although she's worried about me--and it doesn't matter how many times I say, "Mom, I'm doing fine--I'm getting better," she still worries. "You don't sound like you're feeling better." "I'm fine, mom! I'll see you soon, okay?" She's a worrier. I am too, I get it. But really--other people have it much worse. I've heard horrible things from other's flu experiences. I can laugh at myself really well. I admit it, I'm a big crybaby man-child when it comes to being sick. Things are starting to get remarkably better. The last six hours or so, I actually stopped pouting! This is progress! My son-in-law came over today to help me with a store run. I put on the mask. I needed propane for my outdoor patio grill. I use it a lot! I've missed it lately! Thank you, Kenneth Lee! I'm making a conscious effort to spare you the details of this flu experience. It's almost over. I have four remaining doses of the Tamiflu. My downstairs neighbor is the sweetest 83-year-old woman on the planet. She checked on me--wanted to know if she could bring me anything. Awe... she's truly the best. She offered to make a trip to Braums Ice Cream store to get me a chocolate shake. I replied, "Oh Jessica, no, thank you, really I'll be fine. I appreciate the offer. That's very nice of you!" I assured her I was feeling better--and she told me to let her know if I needed anything at all--or if I change my mind on the ice cream offer. Jessica doesn't know about me and ice cream. And that's okay, I wouldn't explain it to her because it's not necessary. It was just one of the sweetest offers ever, and it warmed my heart. I will be returning the kindness to her any chance I get. I ate really well today. I maintained the integrity of my maintenance calorie budget. I remained refined sugar-free. I exceeded my daily water goal by 16oz. And I stayed very well connected with great support friends. No real news here. Just getting through this stuff. Thank you for stopping by for a few minutes! Tuesday marked one thousand consecutive days of logging in MyFitnessPal. This has been and continues to be a very important element in my daily plan. The flu continues. Today was marked with fever and other undesirable symptoms--and I slept a lot, more than usual. I'm on track with my medication. I'm trusting this gets better quickly. I sincerely appreciate all of the well wishes. I've heard from a bunch of people today. Thank you! I'm going to be just fine! I've talked with mom, too. She's doing well. I can't see her until this flu virus clears completely. I haven't really felt like eating, although I've done fairly well keeping my calories near goal. I've left more on the table tonight and that's okay. I've kept it fairly simple. My focus is making sure I take all medicine, sleep well and get well. I maintained the integrity of my maintenance calorie budget (under budget, of course), I remained refined sugar-free and I've stayed well connected to my support friends. I really wasn't feeling too bad this morning. I decided to go to work and get back into the groove. Usually, even if I'm not feeling well, I can sound like I'm just fine on the air--but clearly, I couldn't pull it off this morning. It was a nice try. A 9:30am appointment opened at my doctor--and I made it there. They swabbed me and I tested positive for flu. I was surprised. I was convinced this was something of the "flu-like" variety. I'm following doctor's orders and staying home, taking TamiFlu, Nyquil caplets, and ibuprofen, getting plenty of rest and basically, letting this thing do what it does over the next four or five days. I can't visit mom until this is gone. I can't go back to work until Monday. With or without fever, I'm contagious, so they tell me. I maintained the integrity of my maintenance calorie budget, I remained refined sugar-free, I met my daily water goal and I stayed connected with support. Maybe this stuff will go easy on me since I'm hitting back with the medication? I hope so. I'm not good at being sick. Just ask anyone who knows me extremely well. I will take good care--in fact, extraordinary care! I stayed home today. I think I'm fighting off the worst of it really well. I'm clearly not feeling well, but worse symptoms other have described aren't part of this. I hope it stays that way. I was able to get plenty of extra rest today. And I think that has helped. I've also been taking Nyquil caplets. I considered going to the doctor, but with the absence of heavier symptoms, I made the call to ride it out a little more and see what happens. Now, if I wake tomorrow with raging symptoms, then that'll turn out to be a bad call. Keeping tonight's edition short. I'm headed back to bed. I left work a 1/2 hour early. I started feeling horrible midmorning. Almost everyone at the studio has gone through a round of this stuff and a couple have had a couple rounds. I hardly ever get sick like this. And it isn't full blown just yet. I hope and pray it doesn't develop further. I got home, climbed into bed and slept for a couple hours. I woke with the same symptoms: Heavy, congested head, sneezing, coughing, constant tickling in the throat and a mild nauseous feeling. I had a vitamin C-packed orange for my last food of day. I also ran out to get Nyquil. I'm glad I checked the ingredients! Liquid Nyquil contains high fructose corn syrup! The caplets do not. I grabbed the caplets. I'm cutting today's update short in favor of more rest. Today: I maintained the integrity of my maintenance calorie budget, I remained refined sugar-free, I met my daily water goal, and I stayed well connected with great support--both giving and receiving. It was a solid on-plan day. I thought it might be interesting to go back in time to three different January posts from the archives. The first is an excerpt titled "Ending The Detour" from January 11th, 2014. The following two excerpts come from January 16th, 2015 and January 16th, 2016. Sometimes I go back a year or two to the day and read what was happening at that moment in time. This occasional practice helps me identify areas of growth, re-examine learning experiences, and many times, it reaffirms the importance level of certain elements I embrace each day. If you had approached me two years ago and asked, "Where will you be two years from now?" I would have replied in a matter of fact fashion, offering the most confident of answers full of my hopes, dreams, desires and rigid beliefs. There wasn't any going back, ever. I was out promoting my book and sharing this incredible feeling of freedom a 275 pound weight loss afforded me. It was more than that though, my mission was to spread hope, to help reignite dreams of freedom in others. To simply say, if I can do it, I know you can do it too. "Look at those size 64+ jeans, look at that 500 pound man in the picture and understand, truly believe, it doesn't have to be this way anymore. I'm living proof." Regardless of the confidence level projected, the underlying fear of regaining was always present. I had successfully maintained for over a year because I maintained a schedule of writing, exercising and eating within a reasonable limit. I made these things a priority. But as the Fall of 2012 approached and realities far undershot my own lofty expectations, I started slipping. I became depressed and slowly, I started to retreat into self-destructive behavior. I stopped writing as much, I stopped working out, and I started eating for comfort and escape. And I withdrew from those who cared about me, brushing off their inquiries of concern with, "I'm fine, no really, I'm okay." I wasn't okay. I had written about "knowing too much to ever go back," but it isn't that simple. I was mistakenly discounting the power and science of addiction; forgetting about the ability to ignore the truth, to ignore what's right and good in order to proceed with reckless abandon. In the forward to my book, Ralph Marston wrote about how the more you ignore the truth, the more the truth asserts itself. He nailed it, didn't he? Every now and again, I would try my best to grab control and right myself "before my descent is exposed!" I was thinking it was as simple as writing more, as exhibited in January 2013 when I authored fourteen blog posts. Or perhaps it was as easy as being more available on facebook. Or maybe it was as easy as attending more private one on one therapy sessions. Perhaps I needed more prayer and meditations...like, really mean it this time stuff. I even partnered with a good friend, starting a weekly call support group, where I could offer support via phone, complete with goals, challenges and a fantastic group chemistry that was full of positive in so many ways. And I believe many of the group members knew that I was hoping and praying it would be just as good for me as it was for them. And it was good. Several of the participants, to this day, have nothing but positive words about the group. But I still felt pulled away from good. Eventually I stopped co-moderating the calls because I couldn't, in good conscious, offer support and advice that I clearly wasn't following. As the weight gain became more apparent, I faced a whole different dynamic. Suddenly it became difficult to be in public because it seemed I would run into people familiar with my story everywhere, many who had purchased and read my book. Some made mention, even lightly with a "So, how are you doing?" Others were more direct, "how much have you gained?" And most didn't bring it up at all, but they still knew I wasn't doing well. I don't easily hide behind a false smile or clothing several sizes bigger. I've had little compassion for myself. And that is something that only digs the hole deeper. Self-loathing, guilt, shame--all of the negative emotions of regaining, magnified by my sincere desire to share, to make a positive impact in some small way, became too much to handle. Those negatives kept the cycle going because the more I felt bad about myself, the more I felt paralyzed and stuck in a downward spiral. Letting go of the above mentioned negatives is, I believe, the first step to ending the detour. Having real self-compassion and embracing all that is good in me and understanding I am human, I am good, I have a huge heart and I'm a success, is paramount. No more lies about me from me...Oh, my friend, how horribly abusive I've been to me...That stuff stops. I'm Sean Allen Anderson, by golly. And I'm good. I'm a fantastic human. Ending this detour takes a level of prayer and meditation the likes of which I've never fully embraced. It takes a willingness to offer support and accept support. I've had to stop and pray a few times while writing this post because it's so hard to write. But it's so necessary for me. And this is for me. I'm asking for your encouragement and support. I'm asking for the same dynamics that made my blog a key element in my initial weight loss. I'm asking, in prayer, for the strength and guidance to show me the way, to give me a hand back onto the road. It will require differences in my approach. And I'm prepared to meet the challenges along the way. What has prompted this sudden stop, this surrender and reclamation? A doctors visit. A scale. A prescription for high blood pressure medicine. A mirror. A belief. A hope. A dream. I experienced some stress today and instead of ignoring it, I met it head on and handled it. This is a learned thing for me. It's not my natural way, I promise. The perspective I try my best to embrace is one of a mama bear protecting her cubs. The elements of my recovery and success, are my cubs. If something stands a chance at threatening my cubs, then I must face it down, handling the situation before it handles me. Again, a learned thing. One of the major benefits of losing 275 pounds then gaining back over half, and now losing most of the regain weight to date, are the numerous lessons and experiences along the way. It's enriched my trek in some fairly powerful ways. I'm very grateful! Maintaining balance with my food and exercise despite stressful and emotional things is imperative, because life happens. Stress and emotions come into play occasionally. What is the wise saying? It isn't what happens to you, it's how you react that matters most. It's a very important thing to remember. Those cubs, protect 'em! Mostly, I was immensely grateful today. Because it's challenging days where we discover it's truly all on the line. All of it. And all of the confidence that builds with our success and consistency is revealed to be surprisingly fragile. When we make it through by doing the things we must--and we get to the next day intact, it's like...whoa, that was close. I believe days like that are very important to experience because they quickly expose the reality of life's natural ups and downs. Life is going to happen. And no matter what we do, it's not always going to be easy. If what we're doing each day is what we hope and pray we'll be doing for the rest of our lives--then we must prepare ourselves to ride the waves. I don't want to give it all back. I don't want to sacrifice the freedom I enjoy each and every day at this maintenance weight. And as long as I maintain the integrity of my recovery plan, I feel like I have the best chance. Never guaranteed, but the best chance. I don't know if I'll request a sick day tomorrow or not. I'll make that call at 4:30am. We've been very short staffed lately--so if anyone else is out, it may be a case of going in--getting through the minimum requirements and leaving early. If I have fever--it's a no go, regardless. I'll see what the morning brings. The more I openly share this entire experience, the stronger I feel. Sharing some of the things in last night's edition, fueled a very strong day, today. When you're connected with support, connected with your plan, and you're making time for life, family, and other interests that bring you joy, too--it just feels amazing. Not every day is like that. But when it is like that--oh my, yes-- it actually inspires toward more of the same. It doesn't always, and certain choices can interrupt the positive momentum--but I'd love every day to be like this. I spent time with my grandson Noah, both of my daughters, Irene, Allen and mom today. Some of the visits were short--but still quality. I made certain to get a great workout, and I had a wonderful support call this afternoon. I made some really good kabobs for dinner--spent time prepping, got 'em fixed on the skewers, took 'em outside to the grill and uhg...ran out of propane! I broiled instead. It worked! Today: I maintained the integrity of my maintenance calorie budget, I remained refined sugar-free, I exceeded my water goal, I stayed well connected with exceptional support, and I had a much-needed workout. I'll try for another day like this, again tomorrow. Have you listened to the latest episode of Transformation Planet? You can use this player from PodBean--just click play! If you subscribe for free in iTunes or Google Play for Android, new episodes will automatically show up on your device upon release! Upcoming episodes include Nathaniel Williams, Winifred Morris, and Joy Bauer! Hope Williams Church shares how she made it to almost 300 pounds, tried to lose weight in different ways, many times, plus how and why this time was different. She's lost over 150 pounds. Now, in maintenance mode, her plan requires extraordinary care each and every day--and it's a plan she loves! She's a proud member of the Today Show's JoyFit Club. Stay up to date with Hope when you follow her Facebook blog Healthy Happy Hope. I think sometimes it's very easy for someone to look at what I do and how I'm maintaining my plan and get the impression that it's somehow easy for me. It isn't. I think it's also easy for someone to forget the nearly two decades of struggle near, at, or above 500 pounds... it's certainly not easy for me to forget. The failed attempts, time and time again--sabotaging myself over and over--lose, gain, lose, gain--on plan, off plan--and so on...for nearly two decades. When I started writing this blog over eight years ago, I started turning those nearly two decades into my own personal study of what worked and mostly what didn't. Suddenly, what I perceived to be a collection of worthless past failures became very valuable lessons. The things I do each day are not for show. The logging, the accountability picture tweets, the strong connections to giving and receiving support, the writing of this blog, the production of my podcast, the planning, preparing, cooking, weighing and measuring everything, the daily prayer and meditation--these things and more are my rails of support. And without them, I can't promise you the same steady maintenance mode. I'm lacking in every other area. Rest, exercise, spiritual--every other area needs increased attention. And I know--if I continue lacking in these other areas, it'll eventually infect the strongest areas of my personal plan. This here thing isn't easy. It might come off that way with day after day of "hey--today was great!" But trust, I work at it each day. I focus. I learn. I take extraordinary care. I understand that this is never a given. It's never automatic. And it's never guaranteed. I start fresh each day and try to add one more to the streak. The latest episode of Transformation Planet released tonight. Hope Williams Church is my special guest! I first met Hope and her husband Jeremy at the Today Show in New York City. Hope has a wonderful story. 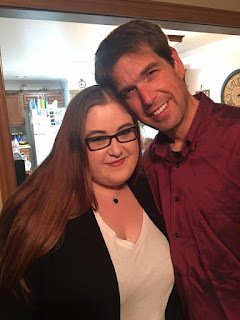 I know she would totally get the first part of tonight's blog post because she also applies the same level of extraordinary care to her maintenance mode as she did while she was in weight loss mode. Today: I maintained the integrity of my maintenance calorie budget. I remained refined sugar-free. I met my daily water goal. And I stayed well connected with great support. I finally watched the movie I've attempted to watch twice! Sully starring Tom Hanks and directed by Clint Eastwood, was fabulous. I stayed awake through the whole thing! In honor of Hope, I enjoyed some air-popped popcorn and apple slices as my #lastfoodofday. Today's radio duties included preparing for this ice storm. The brunt of it hasn't hit just yet, but I'm on call if and when it does. We're still short staffed at the studio with people out sick--so it took some time and effort to figure out the most reasonable way to cover everything with less people. I have the studio lines forwarded to my cell phone--oh my--I just took a call from a man listening to our classic hits station--he was very upset because we played the single of Purple Rain and not the full-length album cut with the longer guitar solo. I was polite, assured him I'd check on the album cut and thanked him and his wife for listening. You do not mess with the music of passionate Prince fans--you just don't. It reminded me of the time I almost got fired for cutting off Hotel California 30 seconds too soon. The program director was a huge Eagles fan--and he was seriously upset. I was trying to back-time into news!! I stopped at the store on my way home. I needed to grab a few things--and refined sugar-free marinara was on my list. I picked up a few other things--grabbed a jar and headed to the checkout. I'm glad there was a line. 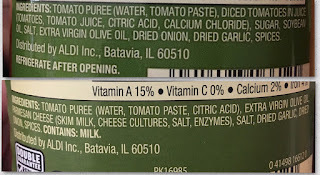 I scanned the label of the marinara while standing in line--and I was shocked to find "sugar" in the ingredients. Did I grab the wrong one??? I know this is the same brand I always depend on for a good refined sugar-free marinara--but there it was, plain as day-- "sugar." I forfeited my place in line and went straight back to the shelf. I started reading labels--and wow--there it was...the refined sugar-free version right next to this very different version--but only subtle differences in packaging and no mention of the altered recipe. Not the same!!! I couldn't believe it! The bottle on the right has refined sugar--the other one doesn't. The label is slightly bigger--but no mention of the changed recipe. The calories are actually less in the sugared version. 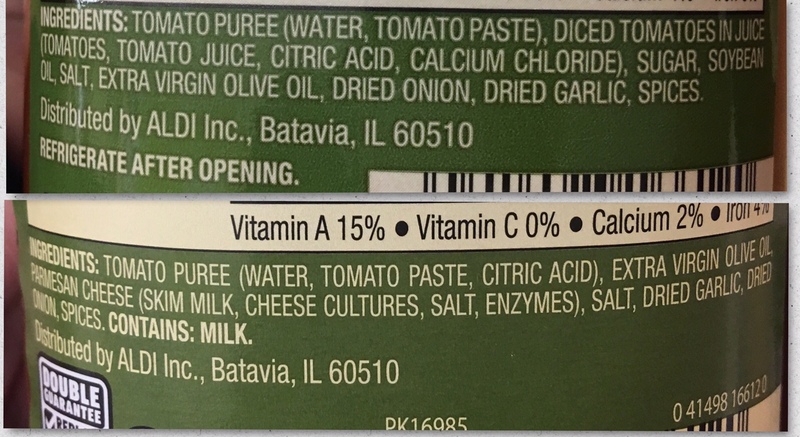 They basically reduced the fat by moving the olive oil from the 2nd ingredient to the 7th ingredient--and added the sugar for flavor, I'm sure. Two different products--both on the same shelf--both with the same label. This was a good lesson for me-- even with foods I regularly buy--I must always read the ingredients list just in case something has changed! I found a few refined sugar-free jars and bought 'em all. I know what a few of my friends will ask, why don't you make your own? That's a great question--maybe I perceive it taking way too long. And if I can use a jar with minimal ingredients and no refined sugar, it saves time and money!!! I'm waiting for this ice storm to kick in. I honestly hope it doesn't happen the way some forecasters are predicting. If it does get bad, I'll be at work early tomorrow. Today: I maintained the integrity of my maintenance calorie budget, I remained refined sugar-free, I exceeded my daily water goal and I stayed well connected with awesome support. I'm very grateful to be where I am along this road. Today would have been much more challenging without the plan and perspective I embrace each day. My abstinence is my responsibility. And I don't need anyone else to take care of it--that's my job. Still, relentless food pushers are annoying, especially when I've politely explained my plan and why it's important a bunch of times over the last few years. I told the same person "no" three times today over the same cookies they were convinced I needed to "try just a little--they're really low in sugar." The theatre where our studios are located, hosted a specialty donut company today at noon. Hundreds lined up for these things. It was a fundraiser--and a good one. They sold out in less than two hours. We promoted it heavy this morning because it was an important fundraiser. I interviewed the owner of the donut company on my show--and all of that doesn't bother me at all. Again, grateful. I made it to the taping of the school system TV show I host with the superintendent--it was fine, I didn't worry about my smile--I just did the job. When I returned to the studio, the line for donuts was long--and the "Emergency Donut Vehicle" was parked in my usual parking space. No big deal-- then I made my way inside and found a very nice gift from another guest I featured this morning: A cup full of miniature candy bars. I immediately took it upstairs to the offices and found a colleague who was eager to claim this cup of chocolate. It was an unusual day. Cookies, donuts and candy bars--all right there. And I made it out with my abstinence intact. I'm proud of this. I texted a few support friends about these happenings--just to say, here's what's going on--I'm doing well! I give my abstinence from refined sugar a very high importance level. I know how refined sugar affects me. And so, in order to remain stable within my food plan--I don't go there. I don't entertain going there. There's no guessing what happens if I were to somehow justify that jump. No guessing, because I know exactly what happens. It's not worth the trade. And so, I'll continue giving my abstinence from refined sugar the same level of reverence as someone in successful recovery from alcohol gives their sobriety. I'm food sober. And grateful. I worked late today--finally got home, was exhausted--and once again, opted for a nap. This pattern is not the best thing for me, but I keep doing it--and I keep getting what I'm getting. I'm aware. I opted for a meal out this evening--one of my usuals, before stopping by mom's for a visit and the store to grab a few things. Work starts a little earlier in the morning. We're getting set for an ice storm. It's not looking good. Tomorrow may be a very long work day. I've made sure I have planned what I need--and I have what I need where I need it. I'll be okay. I hope you're staying safe and warm!! Today: I maintained the integrity of my maintenance calorie budget, I remained abstinent from refined sugar, I met my daily water goal and I stayed connected with good support contacts. The downtown area is very active in this community. I get to see the other side of it each morning, when I'm one of a few downtown, right before the day gets moving. I love the stillness of it--it's a strange calm, a peace--and the music the city plays on outdoor speakers echoes throughout the empty streets, adding a soundtrack to the early morning isolation. I was back at work this morning, appreciating this experience and feeling great about today. I didn't cancel anything, I didn't avoid anything or anyone--I just carried on like normal. The challenges to my speech were minimal--so minimal in fact, I doubt anyone noticed the difference. The missing crown issue really wasn't an issue after all. I even showed up for the TV show taping--and the coach scheduled for our interview, didn't show--so we'll try again tomorrow, and I'll be there. It's not going to be a big deal. I'm discovering it's only a big deal if I make it a big deal. And doesn't that perspective apply to every single thing in life? I don't have a lot of experience with mindfulness in this area. And that's because my first solution to anything and everything, for years and years was: EAT. These days, I don't use food like that. So I'm challenged to actually process things, feel feelings and arrive at previously unknown places--and there, I can accurately and reasonably decide if something is in fact, a big deal. We're short staffed at the studio with people sick--so it was busy at work, but not too bad. I simply enjoyed today. I took extraordinary care. I made an incredible dinner this evening, at a normal dinner time--and that was great. I stopped by the nursing facility for a visit with mom before heading into the studio for podcast work. I accepted that the next episode will be done at some point in the next day or so--instead of pushing myself too late tonight. I'm ridiculously behind on editing interviews. 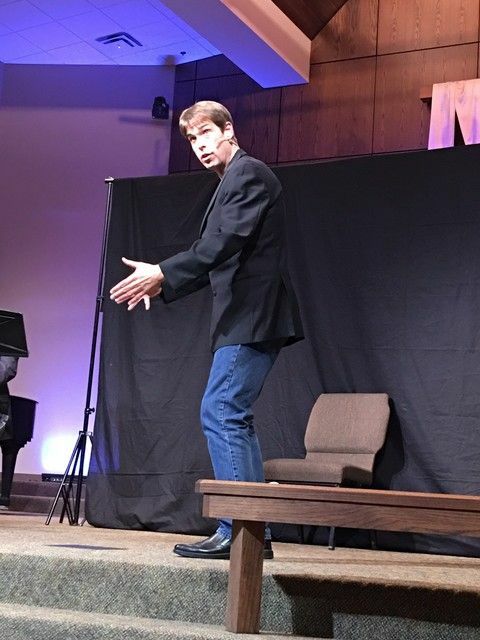 I'm really excited about upcoming Transformation Planet episodes with Hope Williams Church, Winifred Morris, Joy Bauer, and a friend of mine named Nathaniel, whom, if you listen, you'll meet soon. Nathaniel is embarking on his own transformation from a starting weight of 671 pounds. Weighing and Measuring ingredients gives me certainty and helps maintain the integrity of my weight loss maintenance calorie budget. It's a very important element of my personal plan. I stayed home one more day this morning. I hadn't planned on it. It was a last minute necessary decision early this morning. This day has been a long one. Met some family members out at mom's room tonight. It was a good visit. Today was one of those days where I just did the minimum requirements of my daily plan. I maintained the integrity of my maintenance calorie budget, I remained abstinent from refined sugar, I met my daily water goal and I stayed well connected with great support. What a difference pure gratitude makes. I shifted focus away from me and onto others, and the result was a very good day. As far as my crown situation, I have an appointment tomorrow afternoon. Hopefully, I can get something done quickly. I had to cancel today's scheduled taping of the weekly TV show I host for the school system. I have another two tapings set for Wednesday. I suppose I could do the TV without a crown--but I don't want to--and I think that's reasonable to postpone. I also took today off from radio, but I'm back on the air in the morning, and it'll be fine. As long as I don't have to pronounce too many F sounds, I'm alright! I took mom to her doctor's appointment in Stillwater today. She was very happy to get out and see the world again! Her appointment was fantastic. She's doing well on all fronts. Her primary care doctor was very very pleased with her progress. We dined at our favorite Mexican restaurant for lunch. I made it home this afternoon in plenty of time to grab a much needed nap and get ready for a wonderful group support teleconference call. I enjoyed an amazing meal tonight--fired up the grill for a sirloin kabob and made a mess of pan prepared sweet potato, red onion and asparagus. That's good eatin'. I've been really self-involved today. I've been physically ill over what happened during breakfast. I swallowed a crown! My reaction was one of panic--immediately trying to make it come back up, if you know what I mean--and then transitioned to needing to go back to bed, pull the covers up and hope it was just a bad dream. Eventually, after talking with a few family members and friends--I made it to the point of being able to smile and laugh at the circumstance. I had a good conversation tonight with a fantastic support friend--and she reminded me once again--this wasn't the end of the world. This can be and will be fixed. I went grocery shopping this evening. I said a little prayer on the way in--please don't let me run into anyone--just once, not this time. I rarely go anywhere around here without seeing someone I know. And this trip would be no exception. Yep--face to face, an old friend of mine. Uhg... Oh well-- I need to get over myself. So--that's been me today. Self-involved, pity party, sad-- vain... all those things... I'm human. I didn't react to this the way I wish I would have. I really retreated into myself. I kept very minimal contact with support, giving or receiving--and basically, I just did the minimum I could do today. I maintained the integrity of my maintenance calorie budget. I remained abstinent from refined sugar. I met my daily water goal. And I stayed connected with good support--but not as well as I do on a normal day. I'll just be honest with you--I'm straight up embarrassed and ashamed of how I reacted to this situation. I'm not too proud of me. Is there a hole in my smile?? Yes. Am I concerned about how this gets fixed? Of course. Is it the end of the world? No. Am I blessed beyond measure? Yes. There are people--some in my own circle, who are dealing with much greater issues--and handling it much better than anyone could possibly expect. I need to revisit my gratitude list tonight. I lost touch with it for much of today. Again, human. I've taken off work tomorrow--only partly because of this crown situation. I'm also taking mom to a doctor's appointment in Stillwater. I pick up mom at 10am for her 11:15am appointment. One thing is certain: Sacrificing the integrity of my food plan wasn't the answer today. And that's a wonderful thing. I slept in like a champ. I rested very well--and I really needed it. Noah is visiting and staying the night tonight. We stopped by for a visit with grandma this evening. Noah brought along his doctor bag toys and took our temperatures, gave us shots, and checked our reflexes. Dr. Noah was making the rounds! It was fun. He's not wanting to go to sleep, I don't think. Even though he's been going all day and certainly should be totally spent. I'm keeping tonight's edition short. It was a solid on-plan day! Today: I maintained the integrity of my maintenance calorie budget. I remained abstinent from refined sugar. I met my water goal. And I stayed well connected with great support! The following post is from seven and a half years ago. It was June 10, 2009. I was still married with children at home. It was nine months into my initial weight loss. Revealing, really--not the tater tots part--I mean, I've always known those little things presented control issues within me--and notice, I don't eat them today. I was discovering things--a level of self-honesty never before embraced, foods I could eat--things I probably shouldn't--and I was discovering the connection between sleep and my resolve to take extraordinary care. It's interesting to me how seven and a half years later, this is still a frequent issue along this road. And I don't draw the parallel in order to beat myself up--I'm simply identifying something I've not been willing to change. And as well as things have transpired--especially over the last few years, I do wonder how things might be different if I fully embraced a willingness to change in certain areas, like sleep and exercise, namely strength exercise. Today has been a really tough day for some reason. Wow, listen to me “for some reason,” it certainly couldn't be my own doing could it? OK, I'm not going to pretend that I don't know why. Isn't that a wonderful way to make ourselves feel better though? Just pretend that we don't know why it was a tough day. If you get super honest with yourself, like I have, then you realize that often the choices we make determine the outcome of our day. I can make good choices on food all day long (most days—continue reading), but it seems I have a real problem making good choices when it comes to my sleep and exercise schedule. And when the sleep schedule is all messed up, it makes everything else more difficult than it needs to be. I've had problems today with urges to cut loose on a platter of tater tots, I missed my workout, opting to nap instead, and then ended up sleeping way longer than I should have. I have to remember the law of consequences. Everything we do has a consequence, good or bad, and we're the ones that decide. I've come way too far to feel this way. I know that I'm not perfect, but today has just been a mess of emotions stirred by tiredness that has shaken my solid foundation. Maybe I've become too confident. I've been walking along this road with such a confident swagger, perhaps I needed to be reminded of my vulnerabilities. I needed to be brought down a notch or two, just enough to refresh me on the fundamentals that have made this a successful journey so far. Keeping some semblance of a normal schedule is part of that. The easy way out when it comes to food, is to eat whatever and how much ever. The easy way out when it comes to exercise is to just not do it. The easy way out of keeping the schedule on track is to just go sleep regardless of the time or how bad it will mess up the groove. Gravitating to the line of least resistance isn't something I can afford. The smartest thing for me to do after dinner would have been workout followed by writing. Instead I decided on a little refresher nap. Only one problem, I don't know how to take refresher naps. It's all or nothing with me when it comes to sleep. The sad thing is, I really wasn't that tired. I was doing it in the name of “relaxing.” And relaxing is a good thing, but only when everything else is done, affording you the luxury. I couldn't afford it tonight. This is going to be a tough little paragraph. I actually just teared up, wow, I'm such a little girl sometimes. I pride myself on making good calorie choices every day. I'm hardly ever the slightest bit hungry because of my good calorie value choices. But just when you think you are a pro at making these choices, along comes onion tater tots. They should have never made the dinner table to begin with and here's why: Nine small tots for 170 calories. What? We baked them and served them alongside some beef Irene grilled on the George Foreman. Steak and tots. Sounds good huh? Just a horrible calorie value, those tots. But I wanted them. I love the way they smell as they cook, I love the way they taste, I'm completely lusting over them and I'm ashamed. Did I stick with the tiny nine tot serving? No. I kept grabbing them. One after another at 19 calories a piece adds up real quick. Before it was all over, I was over. I wasn't over my calorie budget for the day, but my 500 calorie meal limit, by 170 calories. What felt horrible was feeling those old feelings again. That out of control feeling. Overeating just because it taste so good. That's something I've done my entire life. Why couldn't I just be satisfied with a serving, enjoy them, and move on? I think if the girls wouldn't have been watching, I would have finished off every last one of them. I felt powerless. Over tater tots...wow, just amazing. I've always said that one bad choice leads to another and tonight was definitely proof of that. I felt so horrible after dinner, I just wanted to lay down and relax a little bit, maybe try to reflect on the dinner table feelings and actions. It may not seem to be too big of a deal. And on the surface, it isn't. So what, I had two servings of tater tots, big deal. What devastated me was the feeling of “slipping.” The same eating behaviors that put me up to over 500 pounds were in play at that dining room table. I thought I had squashed those behaviors into oblivion. I was reminded of these behaviors and it was kind of scary. If this were a weekend night I would be heading out to exercise right now. It isn't and I have to be up for work in less than five hours. I'll be going to bed tonight without completing a workout. That's just unacceptable, especially the day before weigh day. But it is the result of my bad choices this evening. I must put this day behind me and realize that I learned a very important thing today. This day was important. It's purpose was to humble me, to show me that I'm not perfect. It has shown me that the difference between doing wonderfully perfect and feeling out of control and horrible is very thin sided. I needed today to further my growth along this journey. I can't believe it's been seven and a half years since that was written! My goodness--time moves quickly! So many things in that post that stand out-- I was coming to terms with my food behaviors--identifying and admitting things I would have kept to myself--and I would have kept on thinking I was the only one who might relate--when really, many of us--most of us, relate in every way described. I did not get enough sleep last night. I'm making sure I get enough tonight. I've purposely avoided things like this because how would I get an accurate count? I decided--as long as the ingredients--all the ingredients were weighed and measured, then I could weigh a decent serving--and see how many same amount servings it yields....and that's what I did. First challenge: Finding refined sugar free chili beans. I had to look--but I found 'em! Oh--and as a side dish? Homemade stuffed mushrooms! The calorie count would have been lower with 96% lean beef instead of the 90%. Plus, I could have used less cheese on the chili. But for me and my budget--and tonight, this was perfect. And I have certainty in the count. I really like that! The mushrooms were super simple. I'll never need to buy the Giorgio stuffed, again! I simply mixed an ounce of cream cheese and 14g cheddar-jack--mixed it up until smooth--then filled in each cap--popped into a 400 degree oven...and viola! 15 minutes later, stuffed mushrooms! Oh wait-- I did pre-bake the empty white mushroom caps for about 10 minutes--long enough to expel some of the moisture. It was a kitchen experiment kind of evening! Here's the thing: At my heaviest, I would have never devoted this much time, thought and extraordinary care in preparing my food. My perspective back then would have been focused on "it's such a hassle" and "that's too inconvenient," shifting the perspective around from this way of thinking, changes everything. Now, when I take the time to do this, I'm "honoring my plan" and "I'm taking extraordinary care of me" and "I'm giving my maintenance calorie budget an exceptional measure of certainty" and "this is going to be on-plan and delicious!!!" And now, as long as I use the same ingredients, I'll never need to recalculate--although, I may make a lower calorie version with leaner beef sometime in the near future. I also know what I'm having for lunch tomorrow! I used some refined sugar-free multi-grain seeded crackers I found over by the fancy-shmancy cheeses. I'm a texture person. I like mixing different textures--and for me, a good crunch with a chili like this--oh my, yes!! I visited with mom after dinner. We had her care plan meeting this afternoon. It went very well. She's coming along just fine. There's a few things-- a possibly torn rotator cuff and signs of another UTI--but they're on it--and that's good. Today: I maintained the integrity of my maintenance calorie budget. I remained abstinent from refined sugar. I met my daily water goal. And I stayed connected with great support! Twenty-seven years ago--oh my, seems like another lifetime ago. Everything was different--we were just kids and suddenly, parents too! My oldest daughter turned 27 today. I feel like I should be older than my 45 years. Oh yes, the eventual benefits of starting too young. I say "eventual,' because it's not easy being kids with kids! But here we are on the other side of life. And now, it's all good. Amber and her hubby KL chose the restaurant tonight. It was a Mexican restaurant, but one I rarely visit. In fact, I've eaten there maybe four or five times in the last 13 years--and never while maintaining the integrity of a personal food plan. I was fairly confident I could navigate this place--although it would take some Q&A with the server. After scanning the menu, I asked about the ingredients used for their salsa. "Any refined sugar?" I love it when the server says "I don't know, but I'll find out." I would much prefer the server go directly to the kitchen and ask the person who creates the food, instead of "uh, I'm not sure," -and I've heard that before, followed by a blank look. Rarely happens that way--but occasionally I must ask directly for what I'm needing in such a way as to impress critical importance. Because it is THAT important to me. This place was wonderful. I also ask about the shells used--making sure they're corn based. After a short while, the information was in--no refined sugar, corn-based tortillas--and everything made in-house. I was able to order separate ingredients--and assemble my plate, easily. It was great! Mom's nursing center is located a 1/2 mile from the restaurant, so we all headed over for a visit after dinner. KL is hilarious, by the way--in fact, he's yearning to try stand-up. I think he should. It wasn't long before we were all laughing loudly...maybe too loudly! In between laughs and catching her breath, mom uttered, "I haven't laughed this hard in years." It was good therapy for all of us! Today: I maintained the integrity of my maintenance calorie budget. I remained abstinent from refined sugar. I exceeded my daily water goal. I stayed well connected with wonderful support. And I completed a challenging body-weight strength training routine this evening. I feel well. I need a good rerun tonight! I've got one a little later in this post. Today was a solid on-plan day--very busy, too. I prepared one of my favorite meals: Chicken kebobs with grilled peppers and onions with a side of pan prepared sweet potatoes cooked with olive oil spray---but then--just before plating the sweet potatoes, I gave them generous sprinkles of cinnamon. Oh my... oh my... And as a bonus, I was eating by 6:15 and not 9:15! I had a great workout tonight at the gym. I haven't changed it up--still a solid max level 20/30 minute elliptical ride-and it did the trick this time. I also maintained the integrity of my maintenance calorie budget, remained abstinent from refined sugar, exceeded my water goal and I stayed in excellent contact with great support connections. I visited with mom a little bit this evening. We have a meeting to discuss her care plan with the nursing staff on Thursday. She told me one of the staff members recognized her from the New Years Eve picture we took. Mom isn't on my blog or Facebook during this time, so it took her a little by surprise that someone would recognize her. She was smiling, so I suppose it was a good experience. This post is a fairly recent one, from late November last year. It's one of my personal favorites of the last few months. When we help others, we're helping ourselves. Today was a great day of staying actively engaged in giving and receiving support, both individually and in the Monday night support group I facilitate. Today was week one of a new eight-week session. It was a fantastic start for the new year! I spent a little time with mom this afternoon. She's doing better, especially after getting a new lift chair today! I met one of mom's nurses today whom I hadn't. I expressed a few concerns and she immediately got me the answers and solutions mom needed. It feels great knowing that mom is in a place where her extraordinary care is made a priority around the clock! Speaking of extraordinary care--I've had a solid day. Certain elements of my daily plan come very automatic and easily for me since I've been doing them day after day for well over two and a half years. The weighing, measuring, logging, photographing, tweeting--it sounds like a lot, but truly, it's become second nature. The things that haven't become second nature--and things that aren't coming automatic and easily--those are the things I must focus on improving this year. It's not a resolution--because I no longer do New Years Resolutions-- it's simply realigning a focus on the elements needing my extra attention. For me, it's in the workout, sleep, and time management areas. And truly, the sleep area starts with the time management area. During weight loss mode--You couldn't keep me from getting four or five workouts in a week. Now, I've let it slide--and I suppose that workout slide has been, in a way supported by my food plan and successful weight maintenance. I'm grateful for the peace and stability within my food plan--I truly love it--and it gives me what I need--and every time I approach the scale thinking my lack of workouts may result in a significant gain, it doesn't. This seems to reinforce an approach that doesn't apply the importance level it needs and deserves. Dr. Lerner has taught me that a good focus on exercise is one that isn't necessarily based on weight loss--a good food plan can achieve weight loss, maintenance or weight gain, if needed... a good exercise plan can also support weight loss--but it also supports many other very important things, like emotional and mental health--and overall fitness level. I must remember this as I approach a better commitment to my exercise schedule. After all, I know how good it feels post-workout. And I need to feel that more often. I had a chance to visit with Noah, Irene and Allen a little while this afternoon. It was a fast visit--but a fun visit. Noah still had some gifts to open! He gets crazy excited!! It's fun to watch. Today: I maintained the integrity of my maintenance calorie budget. I remained abstinent from refined sugar. I met my daily water goal. And I stayed very well connected and engaged with great support. I had today off, and I took it off. I got some things done around the house, napped and enjoyed a dinner out for New Years. I stopped by for a visit with mom this afternoon, too. I have tomorrow off from the radio station, so I'll be sleeping in! I had a great interview this afternoon with Hope Williams Church for an upcoming episode of Transformation Planet! She's lost over 150 pounds and continues to do well in maintenance mode. The perspective she offers is purely powerful! After last night's epic post--I'm keeping this one super-short. Today: I maintained the integrity of my maintenance calorie budget. I remained abstinent from refined sugar. I exceeded my daily water goal and I stayed connected with support!